To welcome all representatives and elect a chairman and secretary. To decide on a regular venue and dates for further meetings. To look at the present provision of footpaths/bridleways in the NW Peterborough area using existing maps. To discuss the technical differences between footpaths and bridleways and how appropriate they are to our plan. 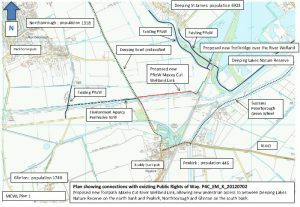 To discuss possibility of forming a comprehensive NW Peterborough footpath/bridleway system. How realistic is it and how can we go about it? Money. Is there any financial or other help available and how can we access it? Is there anybody else we need to include in our working group to make our plans more feasible? We were keen to encourage Steve Horner, the Countryside Access Officer from PCC to attend and offer his advice. Our next meeting attracted 10 people from 5 villages including Deeping Gate, Werrington, Newborough, Glinton and Peakirk, so we decided that we should ignore the City Council boundary and stick to the geographical area where we live and walk. We changed our name to Northern Footpath Forum to reflect this, although some people still think we do guided walks in the Northumbria moors! Efforts to find a more representative name have so far failed. We now meet on the second Tuesday of the month in the Village hall at Peakirk. Check details with the Secretary. One of our primary aims is to map the existing footpaths and find out where we need to link them together. We have been keen to pull in different expertise from people we know and now have an expert map maker and a leaflet designer amongst our supporters. We started as a Parish Council group, but quickly expanded to include anybody with an interest in the local countryside. Some people come to every meeting, some drop in and out when an item interests them. We have had visits from Lincolnshire Rights of Way officers, Lincs Waterways, the Green Wheel Officer PCC and the Estates Manager of the Environment Agency. We have found out that Newborough is the only village we know of in the area where it is impossible to walk out of on a footpath! Our area is defined by Werrington in the south, Deeping in the north, A15 in the west and the new A16 in the east. It is split in half N/S by the River Welland and E/W by the Spalding railway, which make crossing those two barriers safely one of our prime objectives. Consequently, we have an ear to the ground on the upgrading of the railway as the future of the many small crossings will have a dramatic effect on keeping the access open between the two halves. 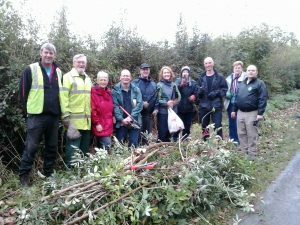 As part of the Northern Footpath Forum’s work a new footpath link was completed in 2014 thanks to a grant from the Natural England Paths for Communities scheme. Hopefully soon, the new footbridge will be put in. We are currently talking to Deeping St James Parish Council. 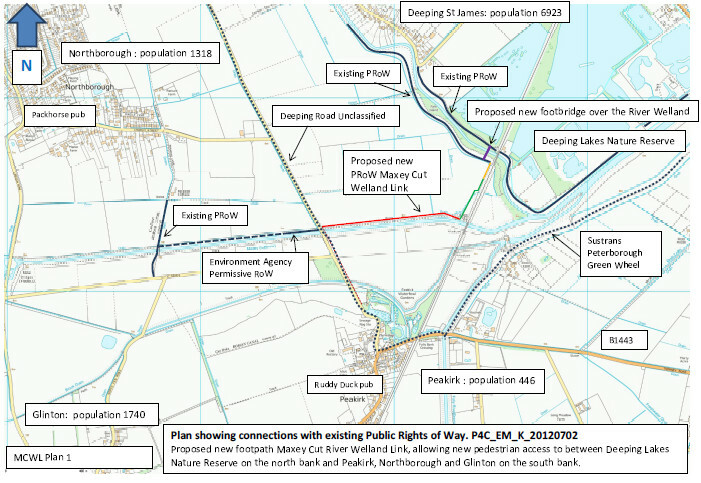 We are actively seeking the bridge over the River Welland to allow local people to walk to Deeping Lakes instead of driving 4 miles to reach a spot 100 yards away on the other side of the river and to create a circular walk for people in Deeping. We have put together a leaflet publicising a local walk made possible by the generosity of a local landowner Mrs Betty Whitton and the negotiating skills of Steve Horner. We have planted hundreds of trees which will form a new woodland & recently underplanted these with native wildflowers. We have put together a pilot scheme to improve roadside verges to allow safe access to non vehicular road users. Our first two areas are Deeping Road from the Old Wildfowl Trust entrance to the Maxey Cut bank & Milking Nook to Newborough Village. We are currently talking to people about funding opportunities. We are amazed how much we have achieved in the past few years and how enthusiastic people have become when they can see a positive way to influence decisions that affect them locally. The group has also become an informal discussion forum for local problems and has helped communications between local Parish Councillors facing similar challenges. We are very grateful for the continued support of the Local Access Forum and Steve Horner in particular who is always willing to spend time looking at the viability of our plans both on the ground and on paper and it is unlikely we could flourish without his backing. We are also pleased to include Kasia Chiva amongst our supporters. She is the Community Development Worker for PCC & has been very helpful with sourcing possible grants & encouraging us to carry on.